The #1 Place in Virginia to promote your Hip Hop music and to check out the new music coming out of VA and the DMV!!! I've been following The VA Hip Hop District for about a month now and i thoroughly enjoy how up to date they keep there site, constantly adding new music videos daily! Also though Im no hip hop artist, I think The VA Hip Hop District is a great way for artist to promote their music for free. All in all I enjoy the site!! 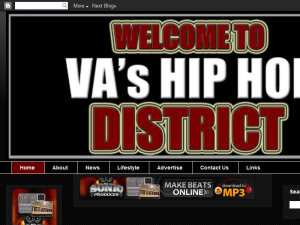 This what your The VA Hip Hop District Blog Ad will look like to visitors! Of course you will want to use keywords and ad targeting to get the most out of your ad campaign! So purchase an ad space today before there all gone! If you are the owner of The VA Hip Hop District, or someone who enjoys this blog why not upgrade it to a Featured Listing or Permanent Listing?